Palm Sunday 2017 brought the folks at the Crafton Heights Church together in celebration of Palm Sunday worship. Our texts included Psalm 2 and Luke 19:28-44. For your convenience, an audio recording of this sermon as preached on 04/09/17 is available by clicking on the arrow to the left, below. I’d like to start this message by showing you one of my favorite photos that includes some of my favorite people standing in one of my favorite places in the world. 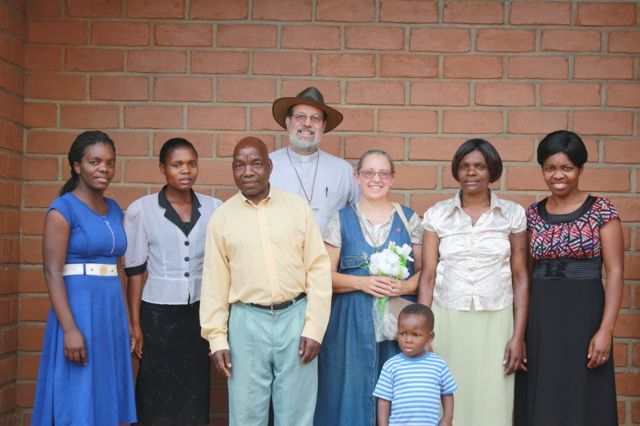 This is the team that has recently returned from an amazing mission to Malawi, Central Africa. 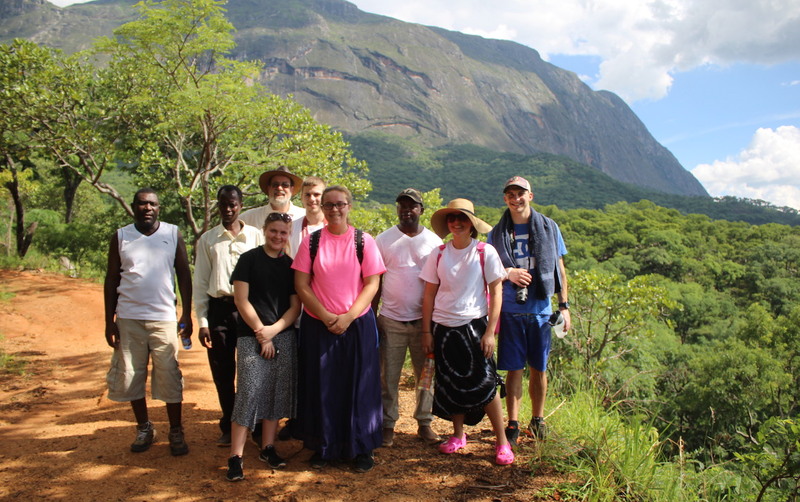 That large rock face behind us is known as the Mulanje Massif, and we’re about halfway into a hike that will take us to a delightful little waterfall. There are three things I’d like to tell you about this photo. I love this bend in the trail because when you come close to the edge, you can see very, very clearly all sorts of places where you’ve already been. When you look back, you can see the path up which we’ve come. Look down into the valley, and the stream and the camp and the road are visible. As we enter Holy Week, and as we continue our Lenten journey, and as we live into what it means to be Christians alive in the USA in the 21st century, we, too, can look back. If we look back far enough, we can catch a glimpse of the Triumphal Entry – Jesus coming into Jerusalem. Wow, that was a day to remember! The waving of the palms, the enthusiasm of the children, the singing – heck, even the protest was kind of fun. Who could forget the so-called “religious leaders” who were so appalled by the things that Jesus said and did? I mean, here was Jesus, receiving and enjoying the praise of the people even as he carried their hopes on his own back, getting ready to enter into the most desolate time of his life. There’s so much that happened on Palm Sunday, and yet from our vantage point, it’s easy to see that one of the central lessons of this day is simply that God, and not another, is in control. As we hear the echoes of the Hosannas, we can know that nothing – not even the events of that horrible week that was to come – is able to separate this creation from God’s intentions for it. And yet, if we stand here long enough, we might also be able to hear Jesus weeping on that first Palm Sunday. We overhear his lament at the fact that we too often choose to act in ways that are contrary to the purposes of God, and we follow paths of isolation, estrangement, or violence… and Jesus weeps. 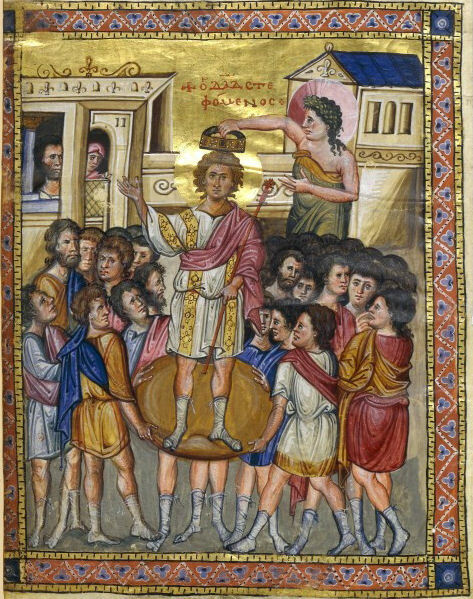 Coronation of King David, Paris Psalter 10th C.
If we stand here this morning and look a little further back, we might just be able to make out something very far off… Do you see in the events of Palm Sunday a shadow of Psalm 2? This song was written for a worship service in which a king would be crowned. It begins with a nod to the realities of its own day: there is political intrigue and conflict, and some are seeking to harm the Lord’s anointed one. The world, even then, is full of those who would thwart God’s intentions – the old translations say that “the nations rage”. As we listen to Psalm 2, it’s instructive to note that this is the only place in the entire Old Testament where God’s messiah, King, and Son are mentioned in the same breath. With that in mind, it’s no surprise that the early disciples remembered this Psalm as they talked about Jesus in Acts chapter 4. Jesus really became the son, king, and messiah of which the Psalm spoke, and they were able to look back and see that. And in joining the disciples in reflecting on this Psalm, we can hear a sound that is even more distinct than the weeping of Jesus on Palm Sunday: the laughter of God. The Psalmist pictures the Lord considering the threat of the nations and finding it, well, amusing. As if the nations and their rage could threaten the eternal purposes of God. Please… The encouraging, comforting laughter of YHWH tells us that the universe is all right and that’s God’s care has not and will not fail. So like those hikers in Africa, we can stand on the path and look back… and it’s good. But let me tell you something about this photo. When this image was captured, I was about dead. The day was almost unbearably hot. I was irritated at carrying a backpack that seemed to have four people’s stuff in it. And, as much as it pains me to say it, I was out of gas. Every muscle in my body hurt and I was tired and achy and miserable. We took that photo because if we hadn’t stopped, the “Abusa with the big hat” wouldn’t have made it. I was overwhelmed, and so I suggested that we stop and take a moment to look around. On Palm Sunday, 2017, God’s people in Crafton Heights will do well to pause and look around. Does anyone else feel as though you’re having a hard time? Have you felt this week or last week or sometime recently like it’s been really tough sledding? And I’m not just talking about your kidney stones or your sister-in-law’s job, I’m talking about the big picture. 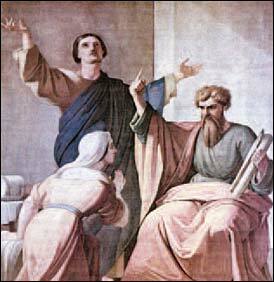 3000 years ago, the Psalmist said that the nations were raging. 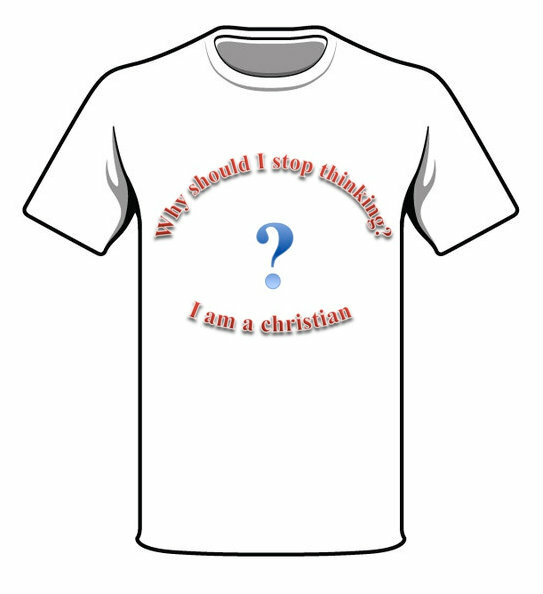 2000 years ago, Jesus walked right into a plot led by the religious leaders. 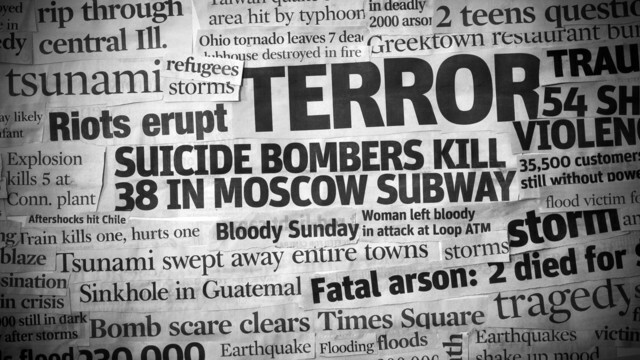 And this week, scores of innocent people were killed in a gas attack in Syria. Already this month, 43 Ethiopian children have been abducted from their villages by armed gunmen who killed 28 adults in the process. There are senior citizens in our own country who lack basic health care. Children in our neighborhood are going to bed hungry. Relationships are strained or broken. Many of us feel as though we are dwelling in uninterrupted pain or grief or depression. You think that maybe you heard Jesus weeping on Palm Sunday but in reality it was the not-so-stifled cries of the people around you. 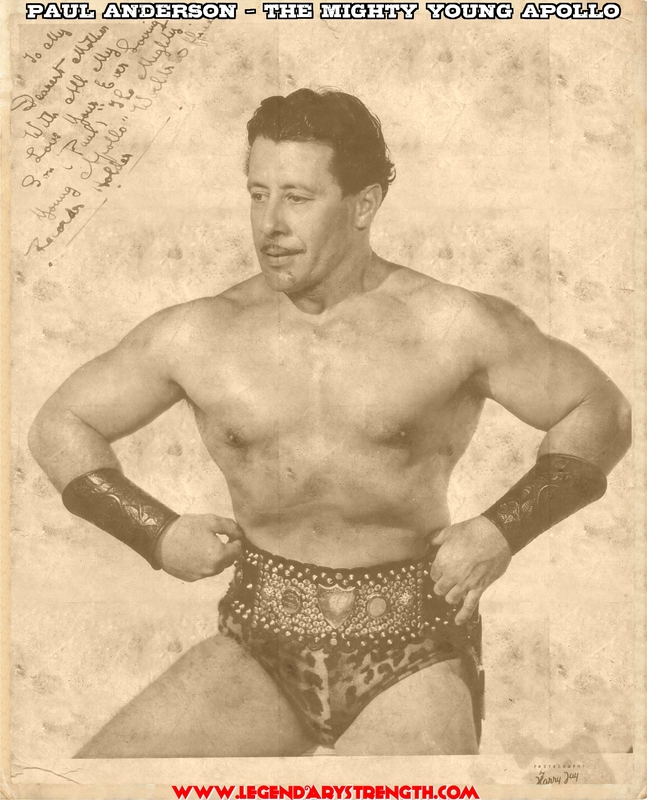 The nations have not stopped their raging. OK, there’s one more thing you need to know about this photo and the place where it was taken: from where we are standing on the mountainside, we can’t see where we are going next. The path at this point disappears into some pretty heavy growth and winds around the side of the mountain. Oh, sure, the people who have been here before will tell you all about the waterfall that lies ahead, but you can’t see it or hear it from here. If you’ve never been there before, you can’t even begin to imagine the beauty of the spot to which we’re headed, or the way that those icy waters will refresh and invigorate even the weariest of muscles. Yet every single person in this photo turned to their right and marched into the forest, even though only three of us had ever been there before. And truth be told, that’s a good metaphor for a lot of us in church now. We may be here because we’ve always come, or we may have a vague hope that somehow things will work out all right for us. Maybe we trust in the one who invited us into this part of the journey, or we believe that the path wouldn’t have led this far just to stop – I mean, it’s got to lead somewhere, right? And so we keep walking. We hold on to the hope that Psalm 2 is true. 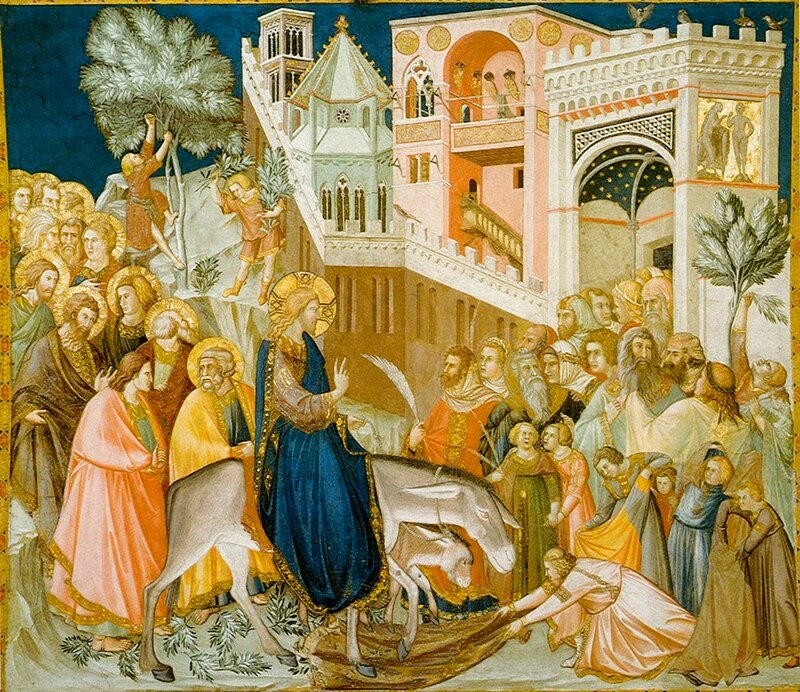 We rely on the fact that the events of Palm Sunday are, in fact, a foretaste of what is to come. But to be honest, I can’t see that far ahead on the path for you or for me; and, unlike that mountain in Africa, I’ve never been here before. But what I can say is this: that I am confident of the path, and that I believe the one who called us to walk on it with him. I trust that in a cosmic sense, we are going to arrive at the truth that seems so far off right now. The people frozen in that photo are in the in-between. They’re not where they started, but they can’t yet imagine how they’ll finish. Similarly, Palm Sunday is between the glory of the incarnation with all of the angels and the shepherds and the wise men and the astounding news of the resurrection… but with the pain of Holy Week on the immediate horizon. Likewise, the death and resurrection of Jesus itself is between the unspoiled beauty of creation as described in Genesis and the ultimate healing that is put forward in the resurrection of the body and recreation of the world of which we spoke last week. So, too, are we, right now, pausing to catch our breath, knowing that we are on our way. And since we don’t know what’s ahead, specifically, for any one of us, then for God’s sake let’s do our best to make the journey better for each of us. Right before this photo was taken, I had set that heavy pack down. After our break, Joe picked up the pack and carried it for me. Our friend Keith walked with the team, and talked in a way that was encouraging and inspiring. Rachael saw that a couple of folks had emptied their water bottles, and she shared from her own. I know. You’re not going to Malawi – at least not any time soon. But you can do all that stuff, you know. You have it in you to pick up someone else’s load for a while, even if he didn’t ask you to. You can stand next to your friend and tell her that you’re tired, or scared, or unsure. 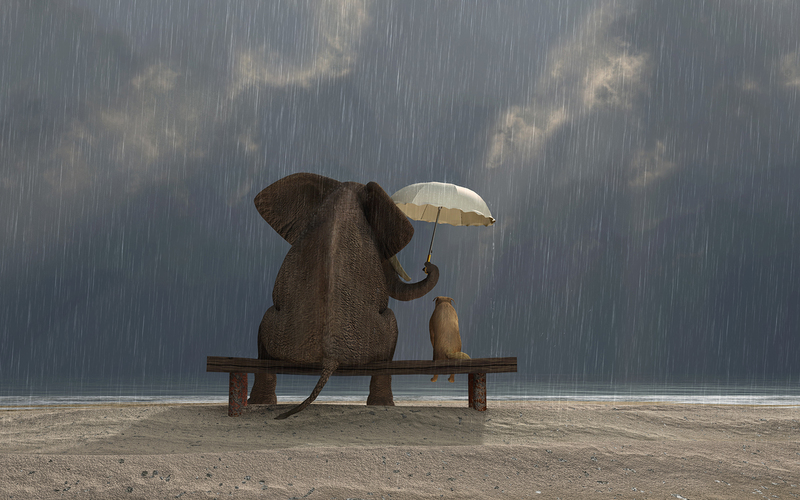 You can share what you have, even when you’re not sure that it will be enough. And you can keep on walking – walk right through the pain and betrayal of the upper room, into the darkness of Good Friday and the cold deadness of Holy Saturday. You can keep walking until you get a glimpse of the sunrise of the resurrection. Maybe you can’t hear the laughter of God right now. But it’s coming. I promise you, it’s coming. And it is for you. 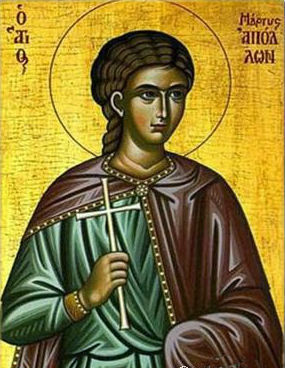 Thanks be to God, it is for you, and for the innocents of Syria and the children of Ethiopia; it is for the One who rode a donkey into Jerusalem and for those who waited with him at his execution. In a real and final sense, the laughter of God is for the last, the lost, the least, the little and the dead. God laughs. And it’s good. Amen. 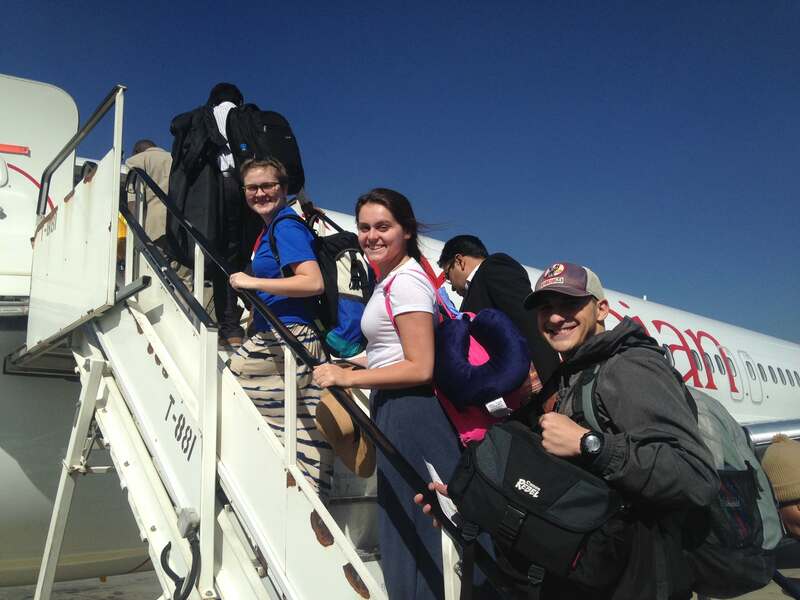 On Christmas Day, 2016, a group of five young adults and I embarked on an African adventure that was over two years in the making. 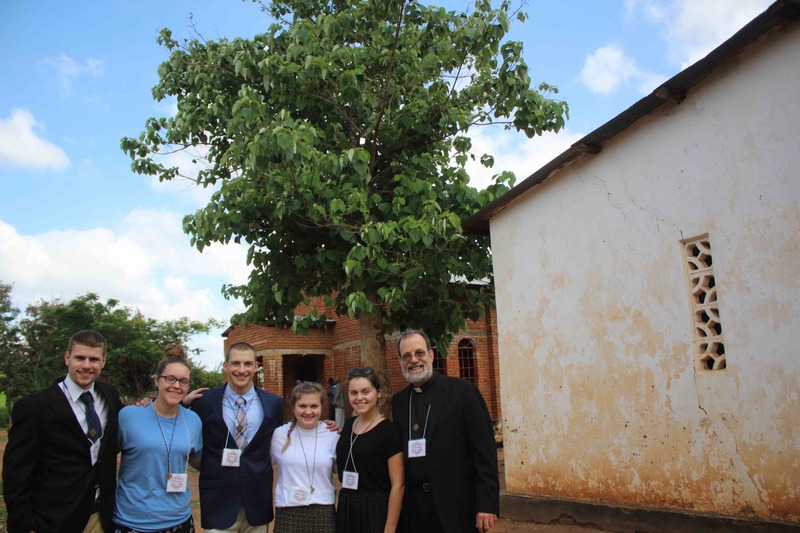 Carly, Katie, Joe, Rachael, David and I are pleased to be in Malawi for nearly two weeks embracing (and being embraced by) the gift that is the partnership between the churches of Pittsburgh Presbytery (Presbyterian Church USA) and Blantyre Synod (Church of Central Africa: Presbyterian). Here is part of our story. 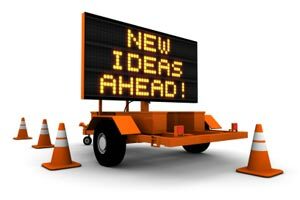 Do you know how it is when someone tries to tell you about something, and you think you know what he or she is talking about, and then when you experience it yourself you think, “Wow, so this is what my friend was meaning…”? You know that sometimes you can hear about a thing a hundred times, but when you experience it – well, that’s just different, that’s all? 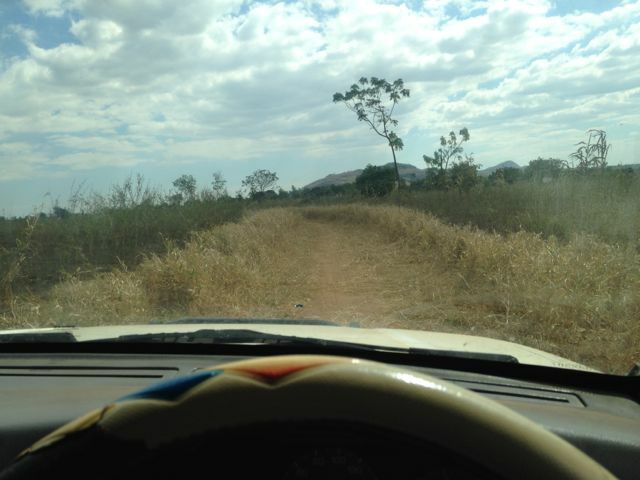 We left Mulanje on the morning of Saturday the 31st and headed for Blantyre. 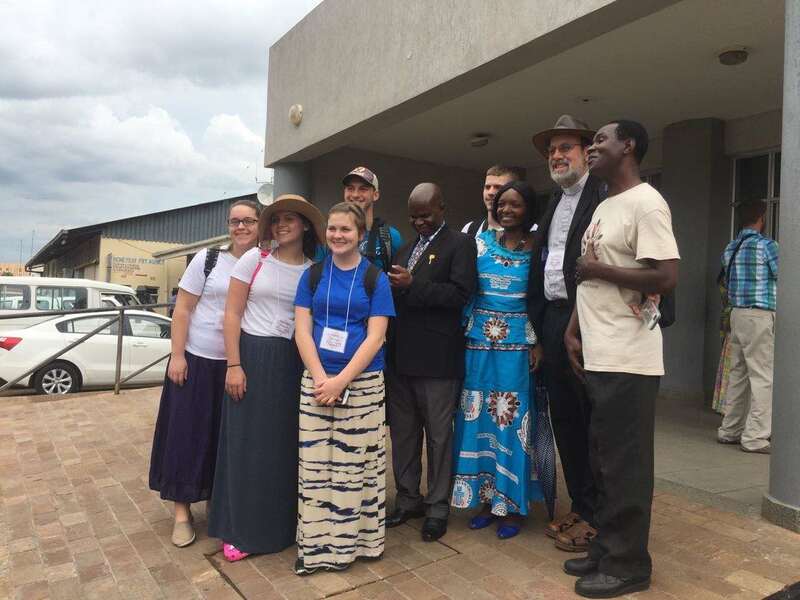 We drove to Blantyre, where the Synod Partnership Steering Committee had organized a lunch for us along with our friends from Ntaja at the Grace Bandawe Conference Center, and then we headed north and east to the trading center of Ntaja. We drove through a landscape peppered with thousands of villages, baobab trees, banana plants, and all kinds of wondrous and unusual sights, and finally arrived in Ntaja shortly before nightfall. 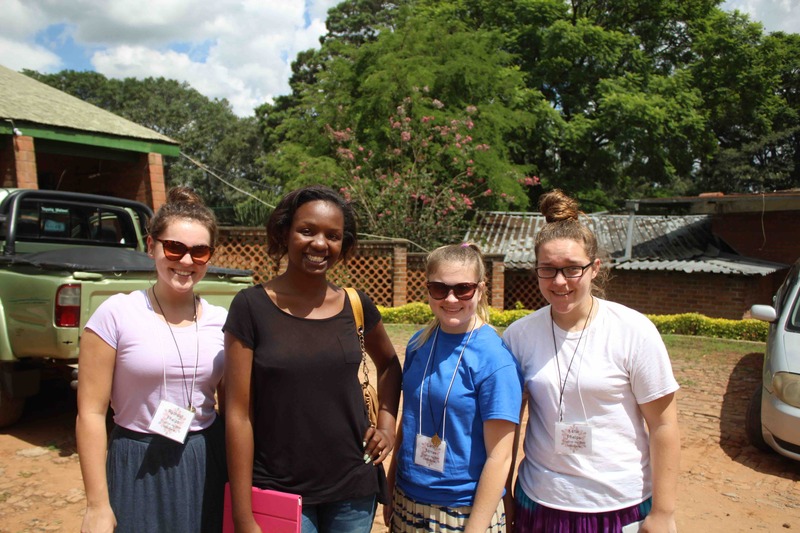 We reunited with Beatrice Mfune, who got to know the team at the New Wilmington Mission Conference. The entire town was experiencing a power outage on our first night, which made getting acquainted with our host families and the new accommodations a little more difficult. Our team had to learn a new style of sleeping (with mosquito nets), a new way of bathing (using water drawn from the borehole and heated over a fire), and all of this took place while it was hot. Did I mention that I anticipated warm weather in Ntaja? That said, they have done admirably! One of the last things that Katie saw in 2016, for instance, was a shooting star. One benefit of being in a remote African community in the midst of a power outage is that when it’s dark – it’s DARK. For the first time in her life, she saw a blaze of light streaking across the heavens, and it was a joy. We attended New Year’s Day worship, which lasted from about 8:40 until about 12:30 or so. 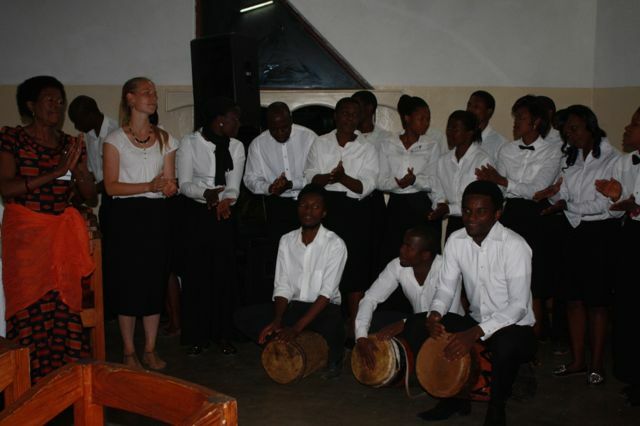 There were more choirs than we could count; a significant welcome from the community; and our team was even recruited to be the “honorary deacons” for the day, which meant that for about twenty minutes as the congregation brought forward their offerings, the young missionaries from CHUP collected, counted and recorded the gifts from the various zones within the church. Preparing for New Year’s Day worship in Ntaja. 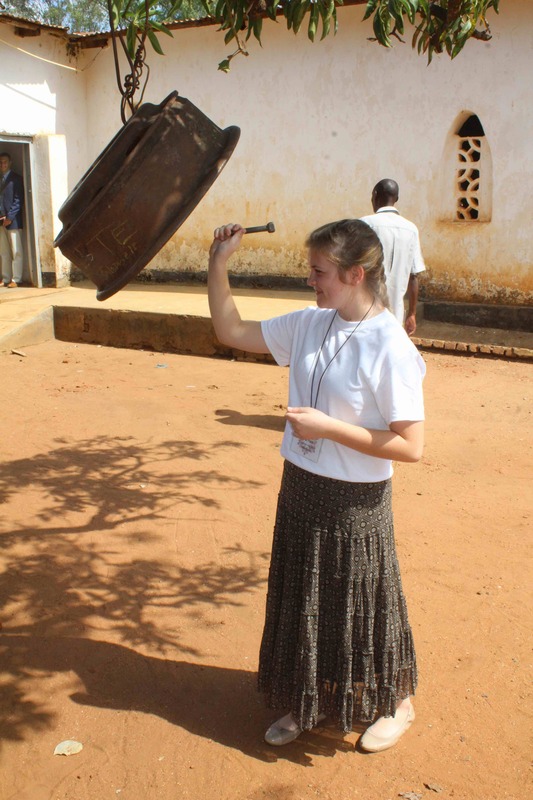 Carly summons the worshipers by ringing the church bell. 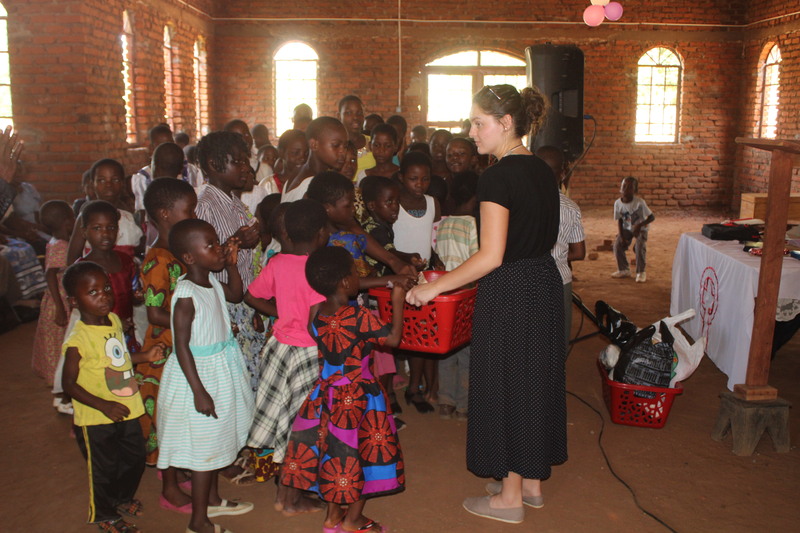 Rachael assisting with collecting the Children’s Offering. The best sermon these people have heard all year! The honorary deacons counting the tithes. 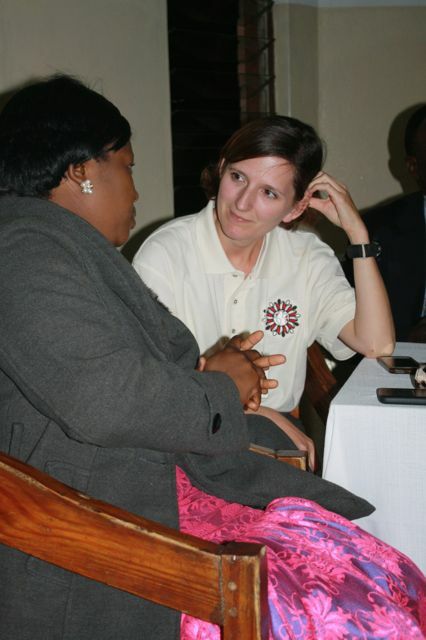 Rose Chitedze shares her thoughts about partnership. 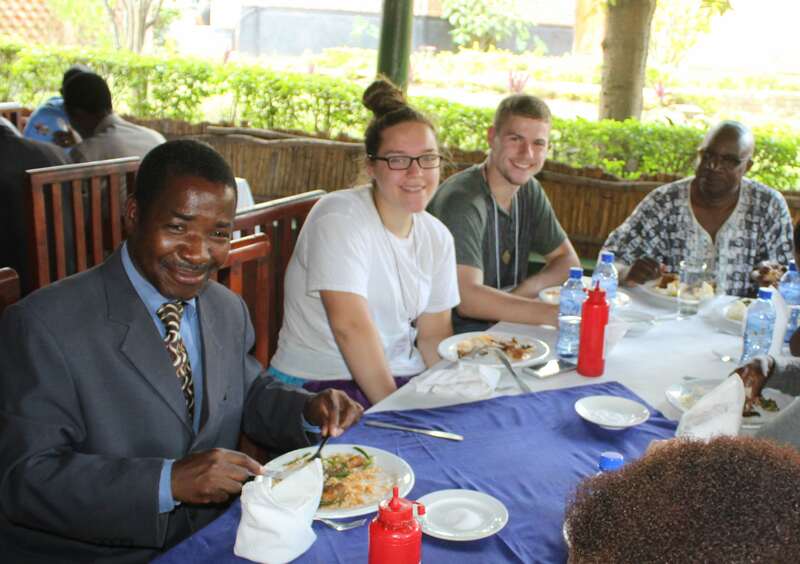 We were treated to a fine meal at the home of Mr. Haiya, who was celebrating his birthday on January 1, and then returned to the church for a three hour meeting with the “Youth Group” of Mbenjere CCAP. 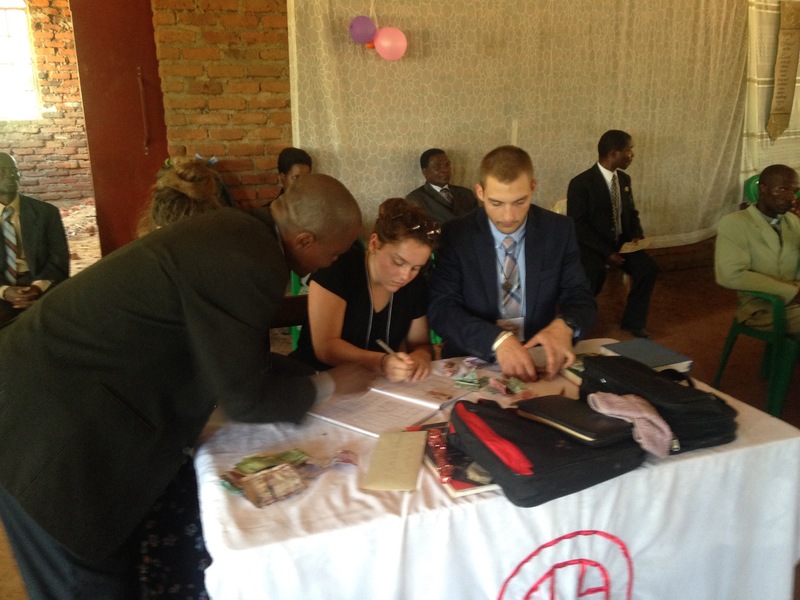 In Malawi, membership in the “Youth Group” begins at about age ten and lasts until age 35 – a little different than our experience. There was a wide-ranging discussion on a variety of issues, and each of our young people spoke with poise and clarity. I was very, very proud of them. 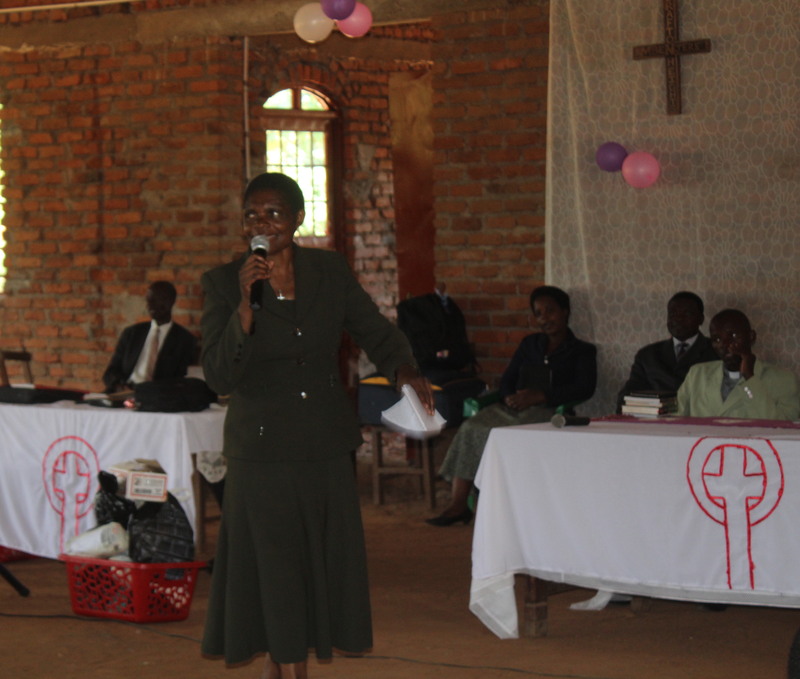 Rachael speaks to the youth of Mbenjere. Katie interprets the role of youth in Crafton Heights. Dinner with Fletcher and his family was delicious. Our friend Fletcher, who visited CHUP in July 2016, hosted us for dinner, and then we retired for the evening. It was a good day in so many ways, and I commended our team for working through the discomfort that the climate and some of the other new things presented to them and for carrying out this mission of partnership very, very well. 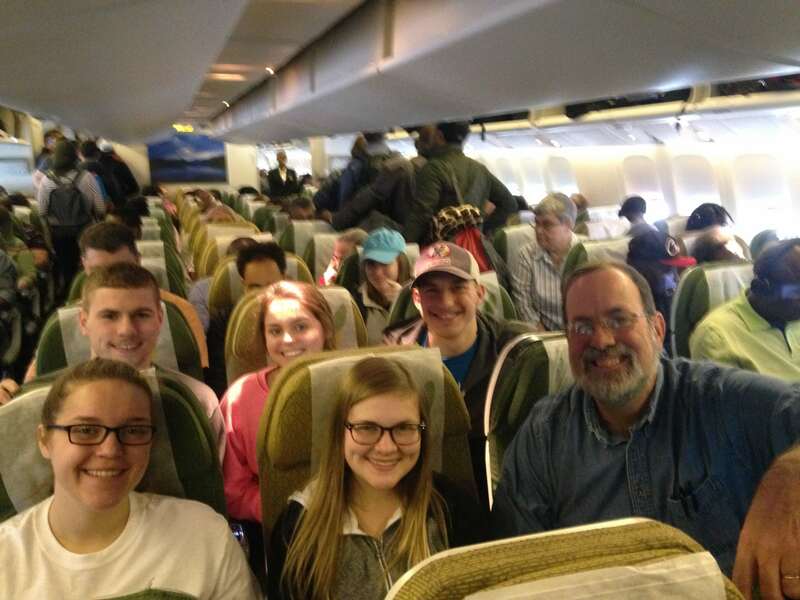 The CHUP Malawi Mission Team 2016-2017 on board Ethiopian Airways in DC! 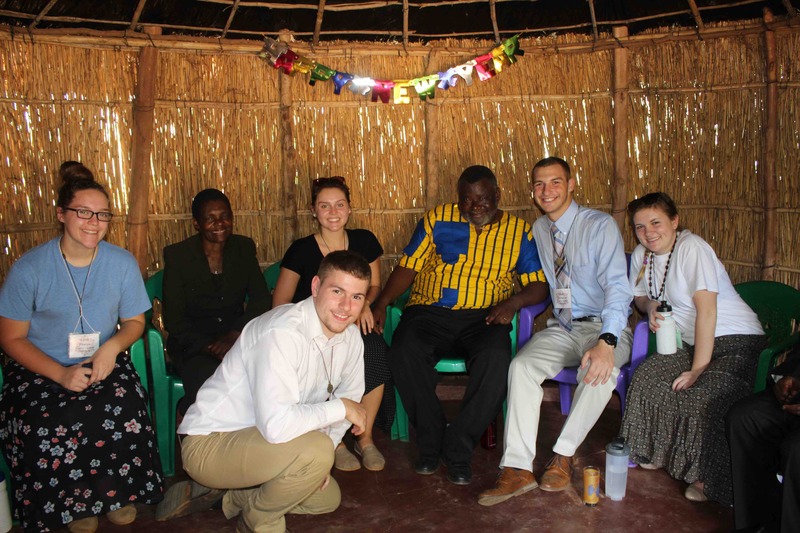 Many of my friends know that in November of 2014 I was approached by two young women in the church youth group – they made a formal visit to me in my study – who asked whether I thought it might be possible for the three of us to visit Malawi some day. They had grown up hearing stories about the ways that God has used the people, the spirit, the challenges, and the gifts of Malawi and South Sudan to form my heart, mind, and spirit; they had seen other people who encountered God’s call in such travel, and they asked me to pray with them as to whether such a journey might be possible for them. If you know much about me, you can imagine how thrilled I was with this question! That initial appointment in my study evolved into a series of discussions, which led to more dreaming, which involved more people, which led us into fund-raisers and orientations and great conversations with parents and grandparents and finally culminated in a gathering in our church basement at 7:30 pm on Christmas day, where our team set off for a Malawian adventure. Fresh as a bouquet of daisies after the first flight, here we are boarding in Addis Ababa heading to Blantyre. 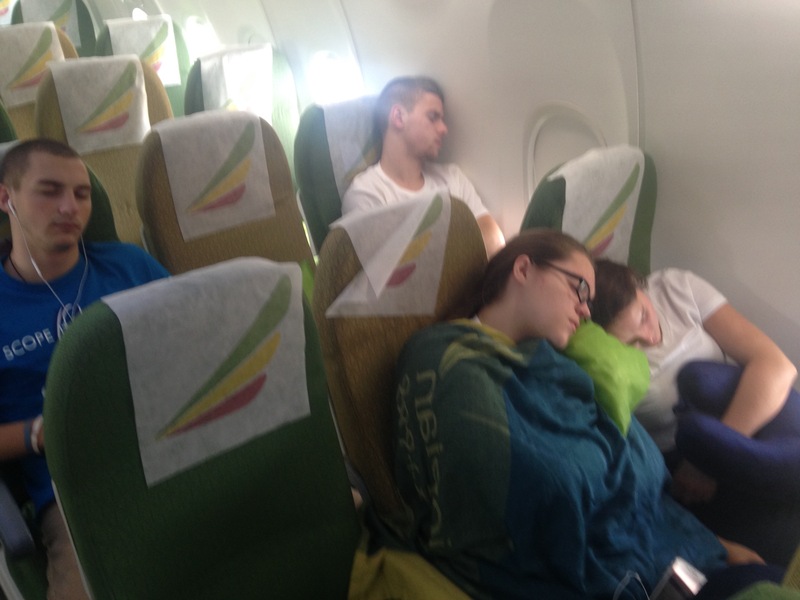 By the time the second flight rolled around, they were ready for some serious sleep! 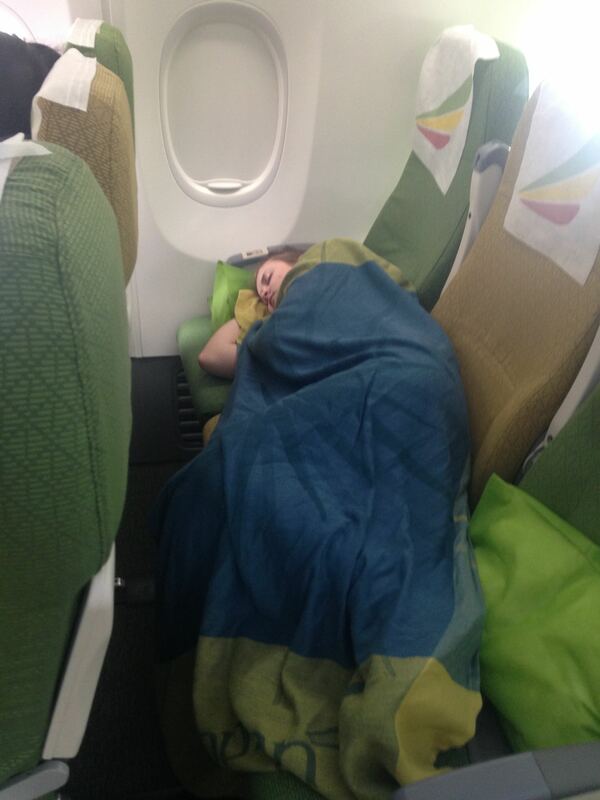 In fact, someone found an entire row which was just about exactly Carly-sized! The original two dreamers, Carly Barnes and Katie Phelps, were joined by Katie’s sister Rachael as well as David Salinetro and Joe Connor. Our journey began with a drive to Washington DC where we spent the night in an airport hotel prior to boarding the long flight to the nation known as “the Warm Heart of Africa.” We endured a 13 hour flight to Addis Ababa, Ethiopia, where after a short layover we transferred to a five hour leg that led us to our arrival in Blantyre, Malawi. 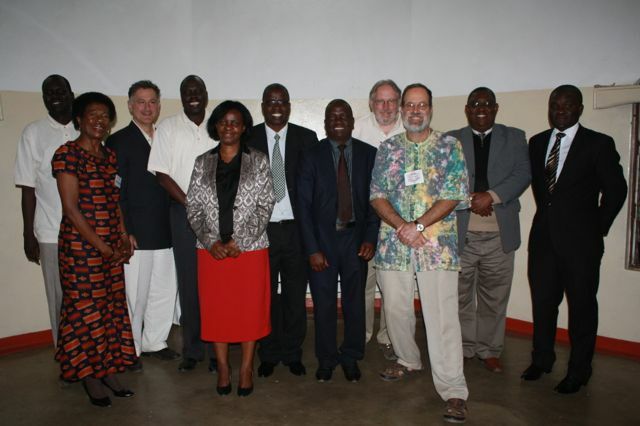 Here we were greeted by my dear friend, Dr. Davies Lanjesi, along with a dozen or so members of the partnership team. 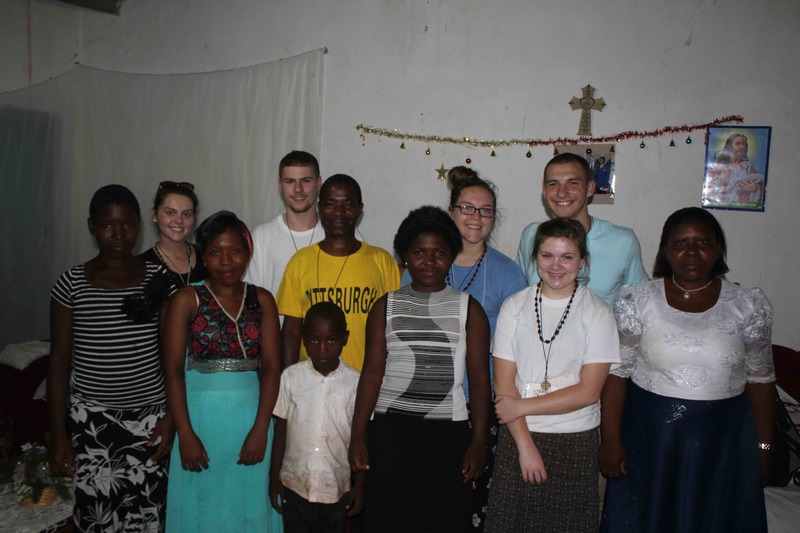 Our entire group is being housed in the Lanjesi home for two nights as we adapt to the new time zone (Blantyre is now 7 hours ahead of Pittsburgh) and wrap our heads around the opportunities that await. We appreciate your prayerful support and ask God to challenge, confront, comfort, and mold us as we spend time with some amazing people in the days to come. 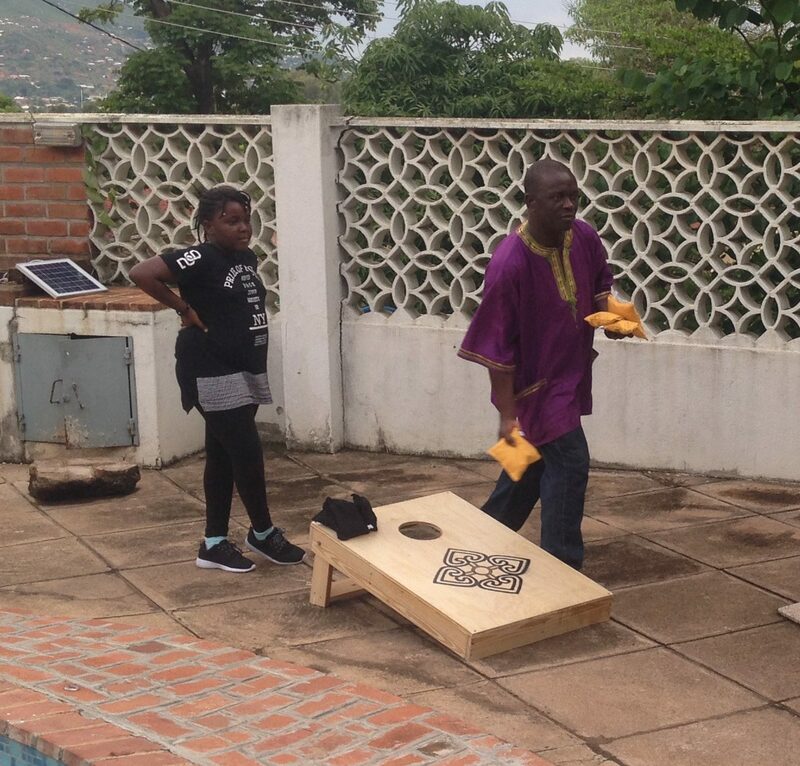 Davies and his daughter Chikondi try out the custom-made corn hole game we brought as a thank-you gift. 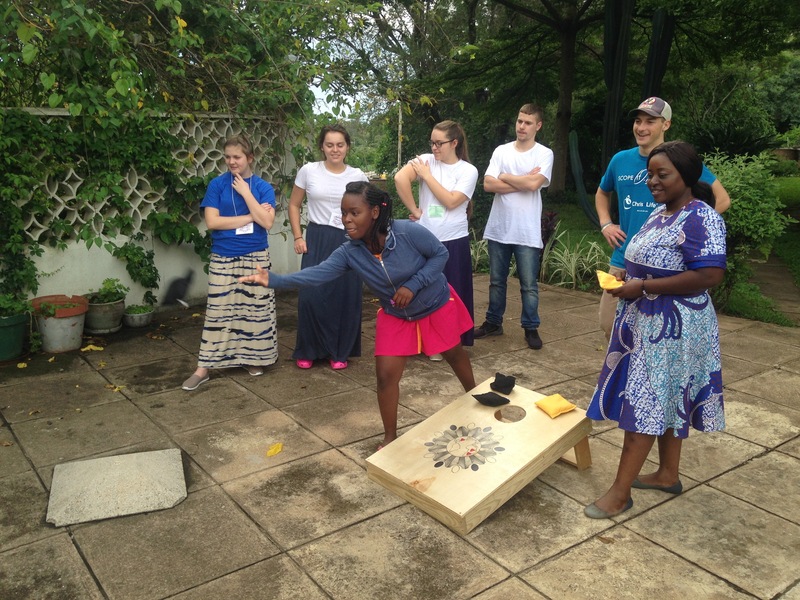 Angel (r) and Thokondwe (l) join the family in testing out the corn hole game. This set, bearing the logos of CHUP and the International Partnership team, was custom made by Tim Salinetro. 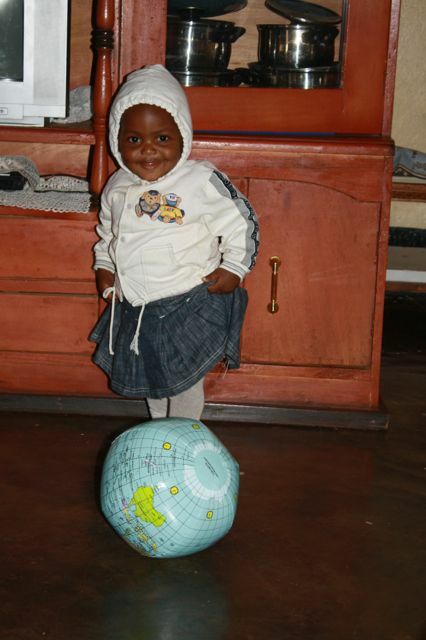 One of the folks who came to greet us was little Madalitso, the daughter of Lindirabe Gareta, the director of the Blantyre Synod Health and Development Commission (yes, she brought her parents and older brother, too!). I wish you could have been here today. It was wonder-filled. I wish you had been here at Grace Bandawe Conference Center as the group of visitors from Pittsburgh and South Sudan streamed in through the late morning and early afternoon. 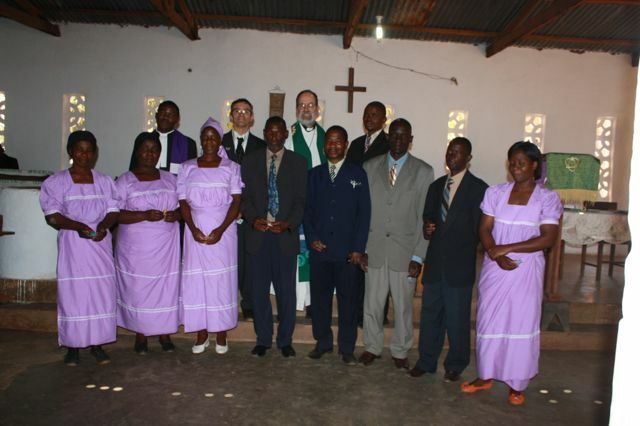 With only a couple of exceptions, most of the team had been disbursed individually to a variety of homes and partner churches within the Synod of Blantyre. 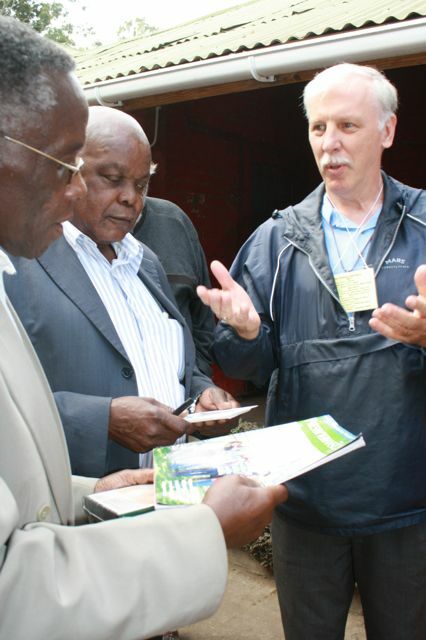 Some were in the big urban center of Blantyre or Limbe. 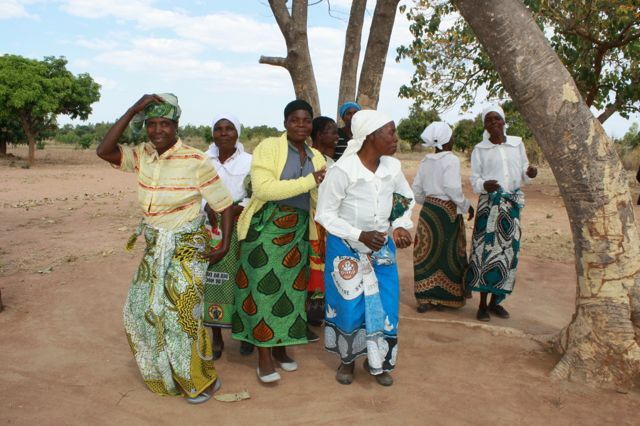 Others went to smaller towns like Balaka, and still others found themselves in pretty remote areas. 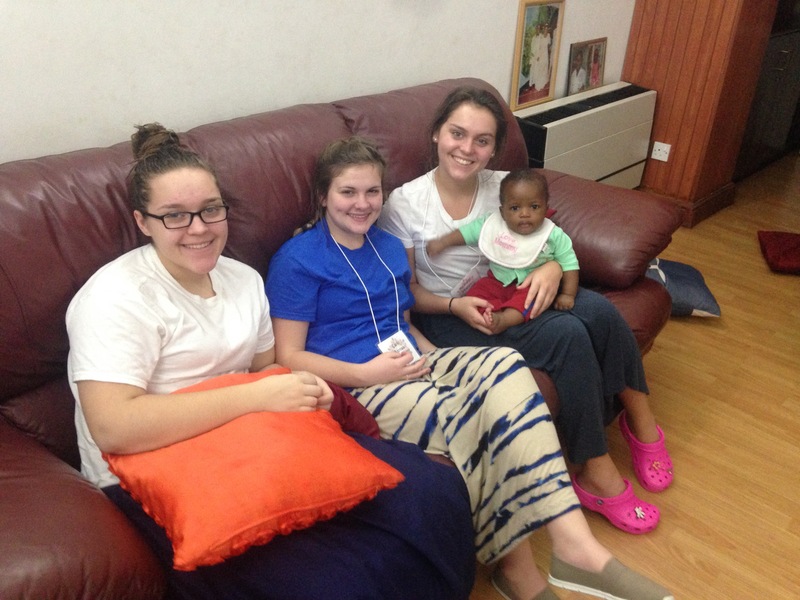 For five days, the team visited hospitals or prisons or schools, led worship, preached (for the first time in some cases), administered the sacraments, went on hikes, had long talks with host families, spent quiet afternoons “resting”, ate a lot of chicken, and who knows what else… and today, we reunited. If you’d have been here, you’d have heard the chatter and concern in their voices as they told stories and listened well to each other. I think you would have liked seeing that. Gregg Hartung sharing resources with his media colleagues at Blantyre Synod Radio. 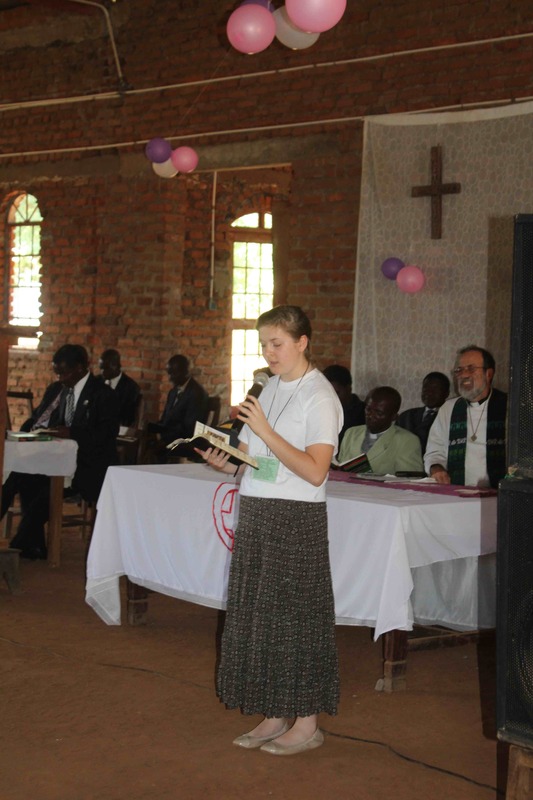 I wish you would’ve been with us when we were able to tour the studios at Blantyre Synod Radio, and to see the progress that’s been made in only two short years. 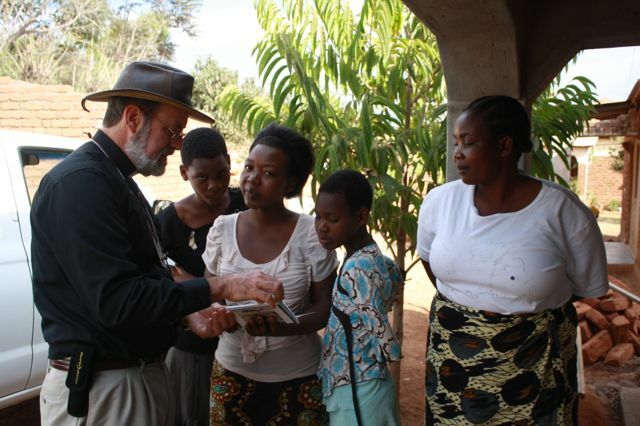 It was particularly gladdening to my heart to see Gregg Hartung of Presbyterian Media Mission pass along some episodes of his award-winning radio program “Passages”. Gregg was a real encourager to the team from Blantyre Synod several years ago when they first shared the idea of a radio station with us. But mostly, I wish you’d have been here for the “Farewell Banquet” this evening. This event, held in the largest room at Grace Bandawe, offered at least 175 people the chance to enjoy the opportunity to reflect together on journeys in mission and ministry. I say “journeys” because while the focus of the evening was clearly on the 2015 team, there were echoes of many previous visits that are still bearing fruit in the lives of those who have been given the gift of travel. 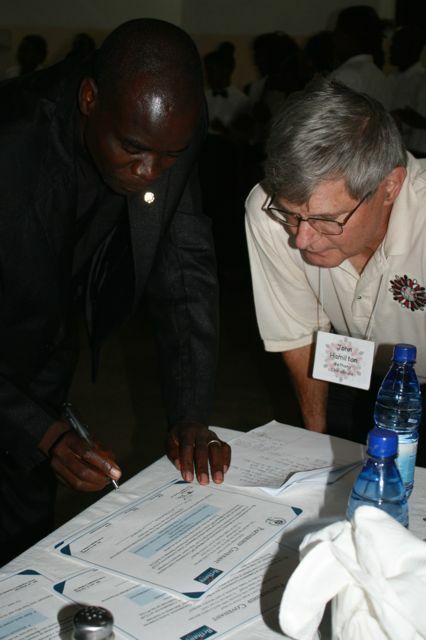 You’d have seen Pastor John Hamilton and Pastor Joseph Maganga sign a covenant of partnership between the Bethany and Chiradzulu congregations. You’d have seen Malawian leaders try to hang on every word of our new partners from South Sudan, and offer ideas as to how to increase the impact of the trans-African nature of this partnership. You’d have seen people show up at the door ten minutes late and be disappointed because there was simply no room for them in this, the biggest room at Grace Bandawe. I wish you’d have been here. Because I wrote this down and added a few photos, you know some of what happened. But you don’t really – you can’t, really – know what happened here. There was a resonance that was palpable and beautiful. I wish you’d have been here. 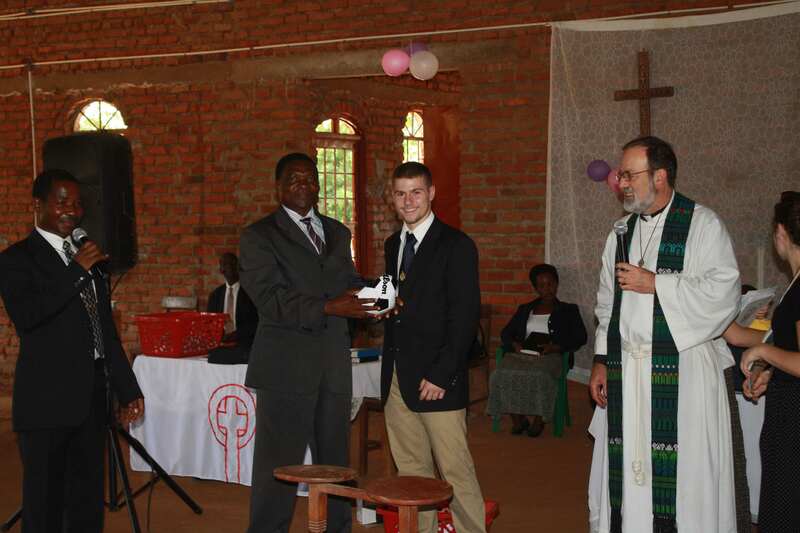 Presenting the gift from Pittsburgh Presbytery to our partners. 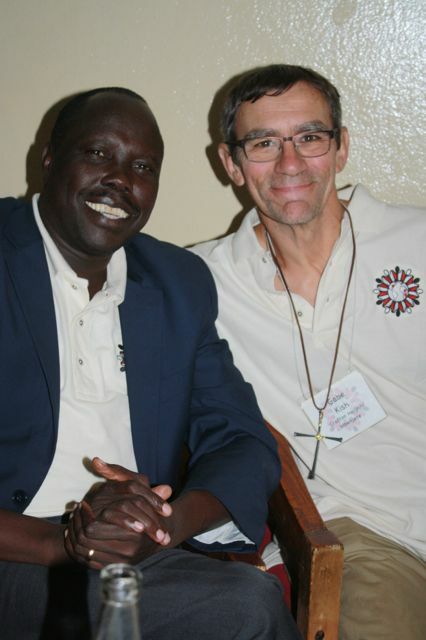 Here I am pictured with Pastor Angelo from South Sudan. Vanessa rekindles a friendship that was initiated during the first hosting period. A group of leaders from three nations met this afternoon to begin to dream about 2016 and 2017. Look and pray for great things! The beautiful, the beautiful, the river? That flows by the throne of God! Know this, dear friends: my mother had many, many gifts. Music, however, was not among them. In fact, there were days when I hesitated to invite my friends to play at my house after school lest they find themselves treated to a concert by a trio whose most talented member was, in my twelve-year-old opinion, a Hoover upright. 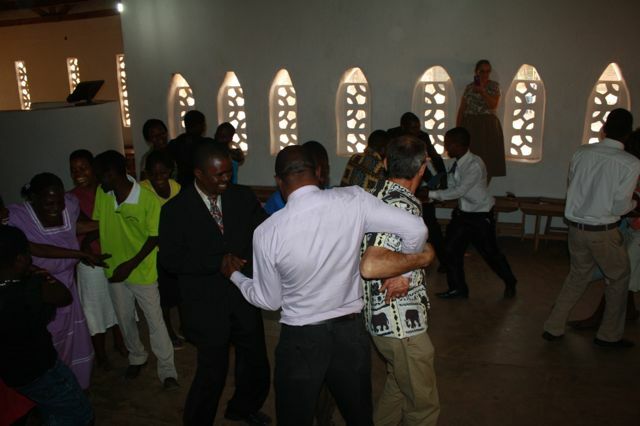 When it comes to the Chichewa lyrics, I’m always ready to give it a go! So far as I can tell, the Chichewa lyrics have no discernible relation to my mother’s favorite hymn, but I’m here to tell you that the tune is the same. I’m pretty sure that the old American gospel song is referring to the day, bye and bye, when we are called from this world of toil and care and freed to live in heaven. Maybe that’ll happen just the way the songwriter hoped it would, and I’d be OK with that. But tonight I write in a land that is shaped by a river: the mighty Shire that flows from Lake Malawi to the Zambezi and then to the Indian Ocean. And I write as one who is profoundly marked by experience in a city that was built on not one, but three mighty rivers: the Monongahela, the Allegheny, and the Ohio, which eventually joins the Mississippi and spills into the Gulf of Mexico. 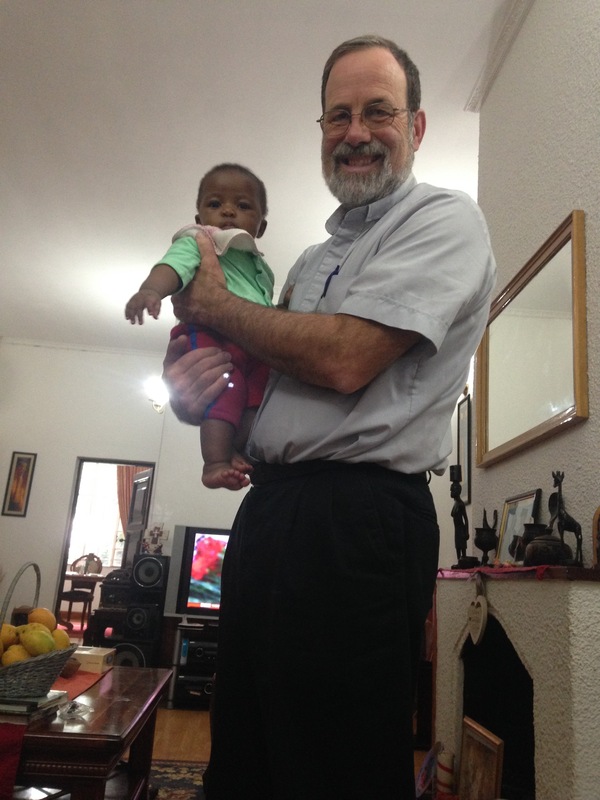 Sharon warmed up to little Dalitso (“Blessing”) by – what else – play! One of the deep and substantial gifts of the international partnership is that we don’t have to wait for pie in the sky in the sweet bye and bye. I am sitting in the remote town of Ntaja, where we have spent the evening with fellow Christians who have become friends. We have eaten well, we have talked of important issues in the world, we have shared stories of family, and we have laughed. Oh, we have laughed. 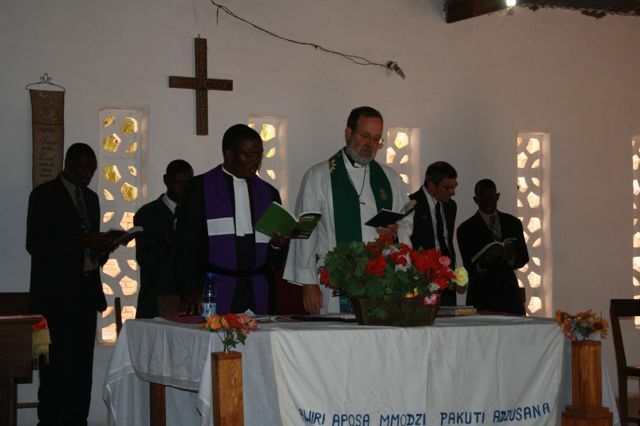 And while I will not be sure of this until tomorrow evening when I am reunited with our whole team, I have every reason to expect that in eleven congregations in numerous villages and cities across Southern Malawi, a scene like this played itself out again and again and again. We come to Balaka or Blantyre or Nansambo or Luchenza not as tourists and not as donors. We come as partners, as the Apostle Paul would put it, “fellow members of the household of Christ.” We are the saints. And we have gathered by the river. And it has been good – very, very good. 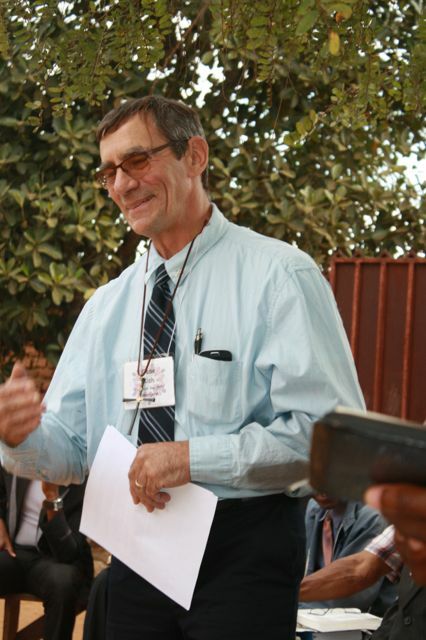 Oh, don’t get me wrong: I’m not here to suggest that traveling to Africa is the only way – or even the best way – to grow in appreciation for the body of Christ. And I’m not suggesting some escapist strategy wherein we hide out in a corner somewhere and sing “Kum Ba Ya”. I won’t be surprised if we get back to Blantyre tomorrow and discover that someone’s trip has been interrupted by an illness or somehow marred by errors in judgment, execution, or misinterpretation. Partnership is a tool that the church can use – and like all tools, it’s not foolproof, and it’s not for every situation. Yet it is the tool that I believe God has used with great impact in my own life as well as the congregations with which I am closest. 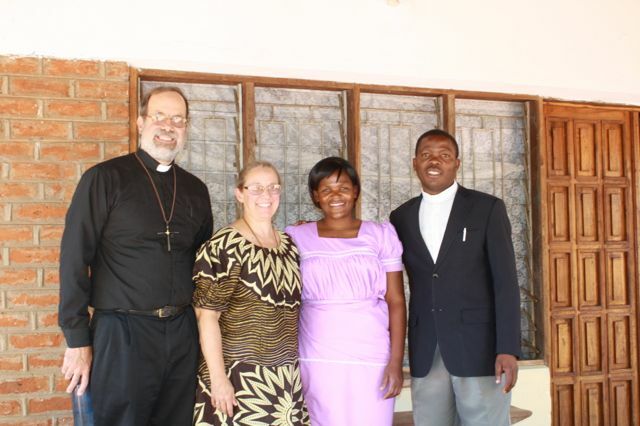 Johnson and Charity Damelakani, our hosts in Ntaja, my colleague in ministry, and our friends. So thanks, mom, for teaching me that if only the best singers sang, the world would be too quiet. 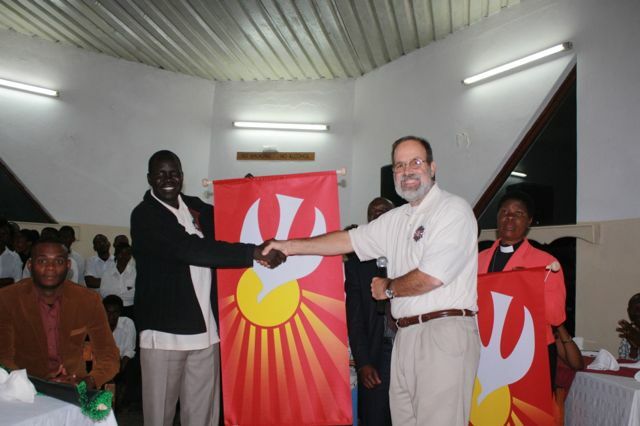 Thanks, partners in Malawi and in South Sudan, for teaching me that each voice has something to add. And most importantly, thanks be to God for a glimpse of God’s ultimate intentions, a community where there is boundless laughter and love and joy. I can see that a little more clearly tonight, and I am grateful. Mrs. Rose Chitedze, a visitor to Crafton Heights last year, invited us into her home. This is her family. 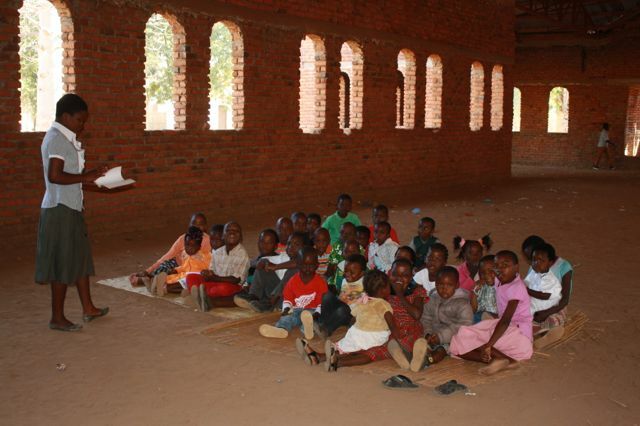 The Sunday School program for the children meets in the unfinished “new building” of the Mbenjere Church. A significant portion of Mbenjere CCAP’s “Executive Committee” welcomes us to worship. 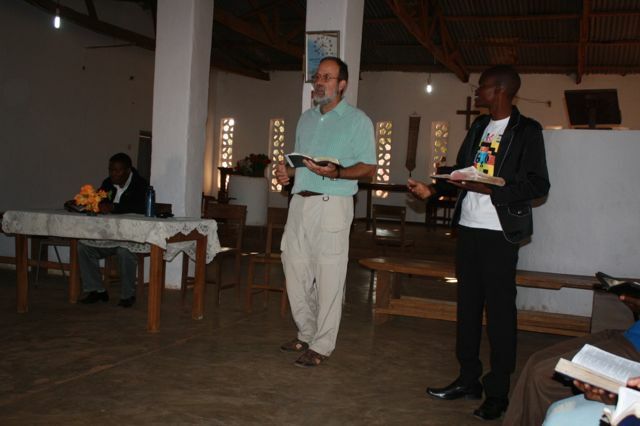 We were privileged to be invited to the “Youth Group” (in Malawi, that’s the term for what we might call “young adults” in the USA). 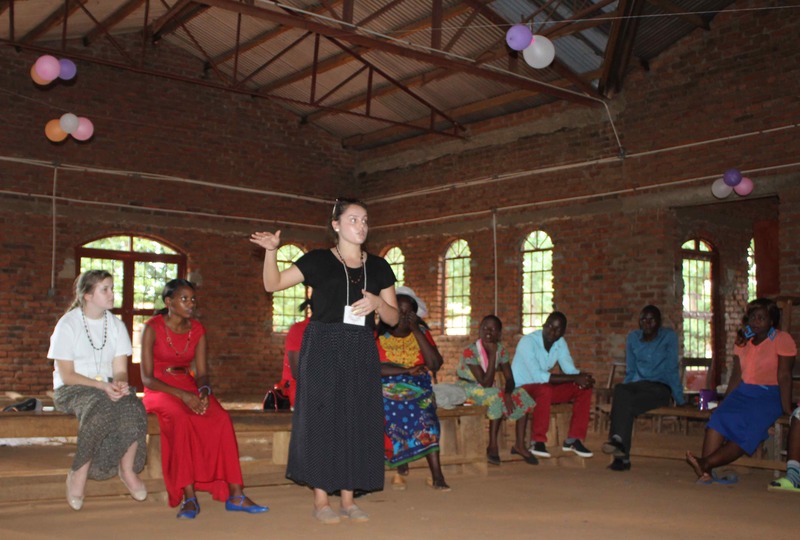 One of the things we did at the “Youth” meeting was to practice some of the initiative games I learned in South Sudan and discuss the ways that the church can bring healing to its community. I remarked to my wife this morning how in so many ways that simple phrase sums up the gifts of the African partnership for me. You see, while “Water is ready” may be the first sentence spoken to me in the morning, it’s not the first thing that I hear. No, far from it. 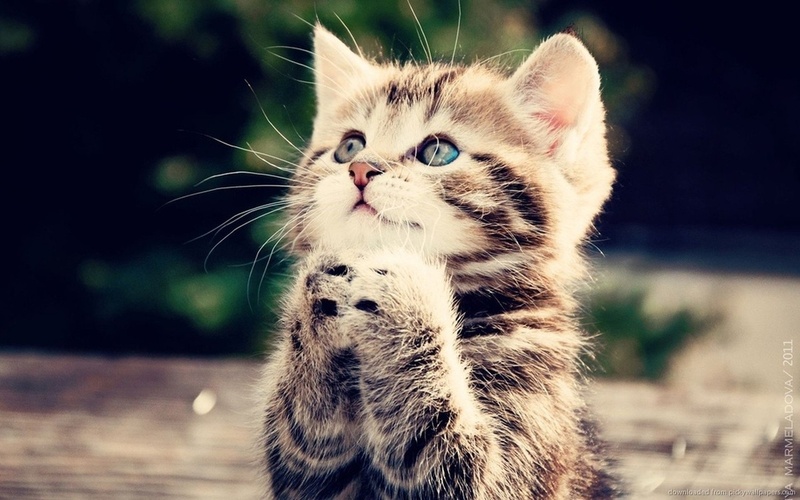 Sometimes I am awakened by the call to prayer at a local mosque. More often, the first sound to reach my ears is a rooster’s crow. Fair enough, considering how many of his brethren I’ve put away this week (more on that below). But once I’m conscious, the sound that reaches my ears is that of wood being chopped and a fire being kindled right outside my window. Five minutes after the fire is started, I hear the weight of a heavy pot being placed on the fire as five gallons of water have been hefted from the borehole into our compound. Then I hear another pot, this one of cold water, being taken into the bathing room. Once the water on the fire has boiled, it is taken into the same room, which is essentially a four-foot square with a drain on the floor. There are the buckets of hot and cold water, and a third empty bucket in which to mix them to the optimum temperature. Lastly, there is a pitcher or small pot of some sort. 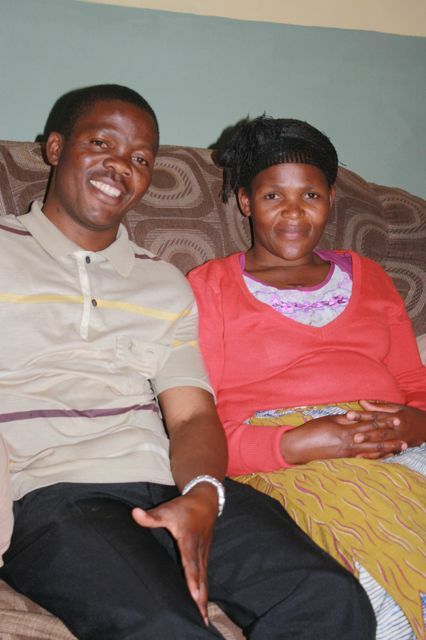 Our hosts for this week are Pastor Johnson Damalekani and his wife, Charity. I have learned so much in Africa in the past twenty years. For instance, I’ve discovered that I really like “Stoney” ginger beer. 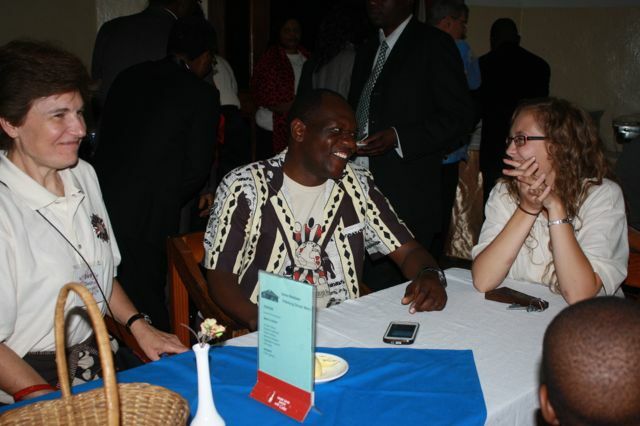 I’m pretty good at telling jokes to an African crowd. 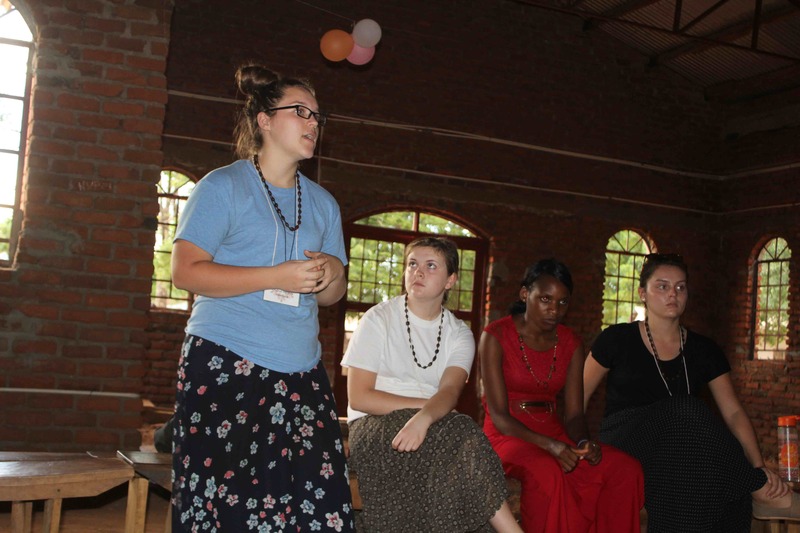 I can barter in the market and baptize babies in Chichewa and drive on the opposite side of the road. But the number one thing that I’ve learned is that I am not as graceful and as hospitable as Christ intends me to be. While I end each worship service at Crafton Heights by saying, “honor all people”, I am a real piker in that department when I compare myself to my African sisters and brothers. When I die, and you get around to putting together those photo collages, I hope that one of them will be of roads I’ve driven. Here, I’m behind the wheel of Menes Makuluni’s pick up truck, which he graciously lent us when the first two transport options for the day fell through. Below are some images of the day. They are fine photos, I know. But a picture can’t capture the warmth with which a cold bottle of Fanta is offered, or the insistence with which I should take another cup of tea after a long worship service. The smiles you see here are two-dimensional, whereas I have been given the gift of being welcomed and honored. I am forever grateful to my African family for teaching me to greet each new face, each new day, each new challenge, each new situation, as an opportunity to show gratitude and honor and joy. Maybe the reason I keep coming back is that I’m a slow learner. I know that most of the people who are reading this know me only in the USA, where I am prone to rush and criticize and push far more than is necessary. I hope that you will catch me improving in my ability to serve with honor and grace. 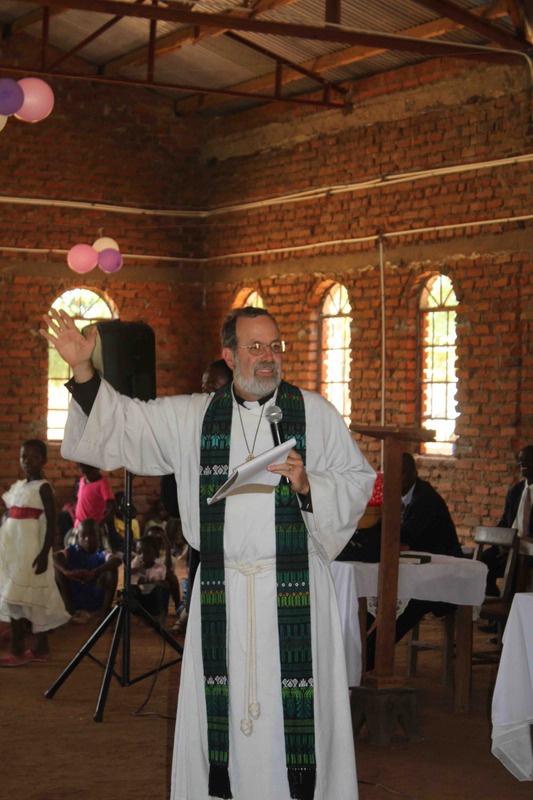 If that ever happens, remember where I learned it – in worship and in worshipful presence right here, in the Warm Heart of Africa. 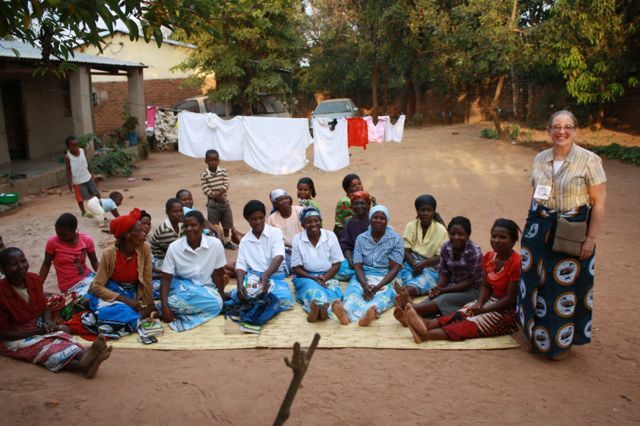 Sharon with the women of the Mpasuka Bible Study, from whom she received the gift of a chitenge fabric. 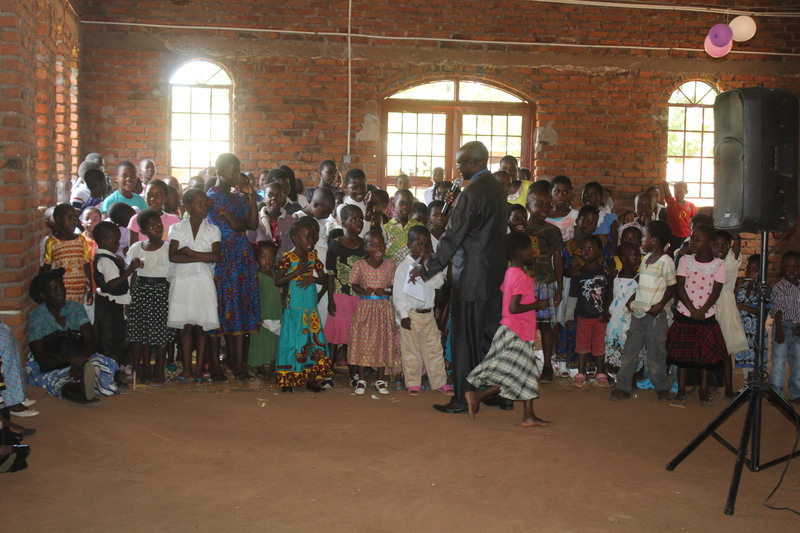 Some of the congregation at Naperi Prayer House welcome us, after having waited for two hours for our arrival. Gabe preaching up a storm on the importance of being a follower. The Saeya family hosted us for lunch today, and they were really interested in the photos I brought along to share. 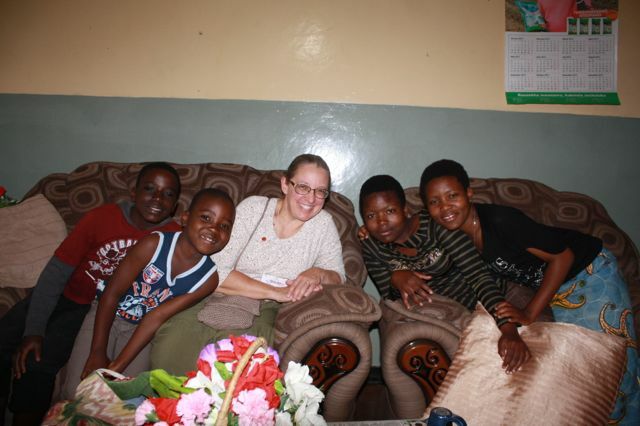 Sharon posing with the Munyenyembe children, whom she taught to play UNO this evening after we shared a meal at their home. 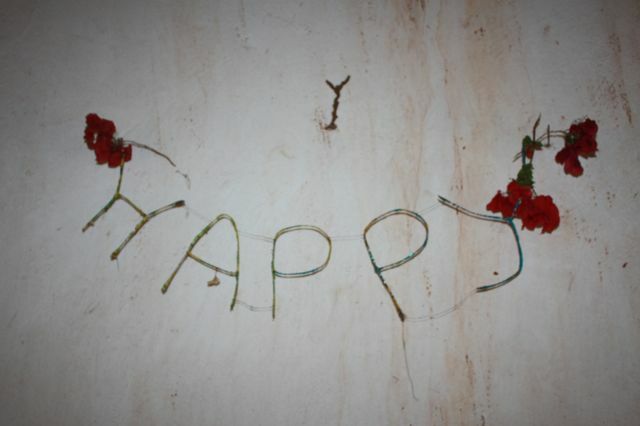 They apologized for the condition of their prayer house, and felt badly about the fact that they had unfinished brick, yet the people of the Khole Prayer house adorned the building with bougainvillea and wire decorations. It was just beautiful.